Su questi fondamentali si eserciteranno i partecipanti al laboratorio, prima analizzandoli separatamente e poi nella loro interrelazione scenica: il lavoro sulla voce naturale, non accademicamente impostata, con lo studio del parametro della proiezione attraverso la recitazione in coro; attraverso improvvisazioni guidate e la composizione di brevi scene mute i partecipanti impareranno a percepire e a leggere, “dal punto di vista del pubblico”, le linee di forza drammaturgiche che si generano tra gli attori in base al semplice posizionamento del loro corpo nello spazio scenico ed alla direzione dei loro sguardi; infine lo studio sulla costruzione di un racconto scenico efficace e coerente attraverso la realizzazione di brevi improvvisazioni guidate, sviluppando la capacità “schizofrenica” di guardarsi da fuori per sorvegliare l’efficacia e la coerenza del proprio agire spettacolare. There is some misunderstanding regarding the actor’s art. It would appear that everything boils down to two concepts, as common as they are generic: “sensitivity” and “energy”. There is nothing wrong with saying that an actor must have sensitivity and energy, but that is of no help in circumscribing his field of action and identifying the specific tools of his trade: the musician, the dancer or the painter must also have sensitivity and energy. All this, in many actors, generates the frustrating feeling of going forward blindfold, with no “compass” by which to orientate his own work technically. Through improvisations, exercises and games, the participants will become aware of their own personal, unique instrument and the way in which it justifies, embodies and makes the theatrical event “happen”. The actor is both the instrument and the instrumentalist, he is both the creator and the very material of his own creation. The laboratory will focus attention on the basic tools of the actor’s art: his own body, his own voice, the physical space in which he acts and the “schizophrenic” ability to look at himself from outside to oversee the efficacy and coherence of his own stage story. Every real actor is perforce an author as well. It is on such basics that the laboratory participants will practice, first analysing them separately and then in their inter-relation on stage: work on the natural voice, not academically attuned, with study of the projection parameter through choral reciting; by means of guided improvisations and the composition of short silent scenes the participants will learn to perceive and read, “from the audience’s viewpoint”, the dramaturgic lines of force generated among the actors merely on the basis of the positioning of their bodies within stage space and on the direction in which they are looking. Lastly, study on the construction of an effective, coherent stage story through the realisation of short guided improvisations, developing the ‘schizophrenic’ ability to see themselves from outside in order to oversee the efficacy and coherence of their own acting within the show. The laboratory will not supply pre-set techniques, tricks or styles of acting; its purpose is to lead the students to the ability to handle the fundamental issues of acting, so that each will be able to produce his own personal responses. 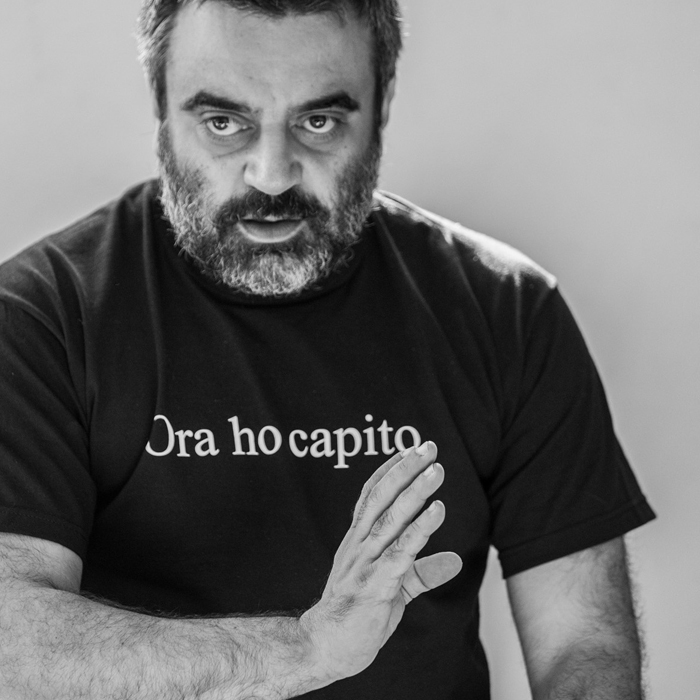 durata / duration 5 giorni, 21-22-23-24 settembre presso il Teatro Magnolfi e 25 settembre presso il Teatro Fabbrichino. Il giorno 21 (primo giorno di laboratorio) dalle ore 11.00 alle ore 15.00. I giorni 22-23-24-25 dalle ore 14.00 alle ore 19.00. Il giorno 25 settembre alle ore 19.00 esito finale del Laboratorio aperto al pubblico presso il Teatro Fabbrichino / 5 days, September 21-22-23-24 in the Teatro Magnolfi; on september 25 in the Teatro Fabbrichino.On september 21 from 11 o’ clock to 15 o’clock . September 22-23-24 from 14 o’ clock to 19 o’clock. On september 25 at 19 o’clock final result of the Laboratory open to the public in the Teatro Fabbrichino.